Each year 28 July marks World Hepatitis Day and, now that there are treatments available to control and cure it, a campaign has launched to ensure its eradication by 2030. This year, the World Health Organisation (WHO) published the first ever Global Strategy for Viral Hepatitis, adopted by 194 Member States, with the aim of eliminating it as a public health threat by 2030. Today, World Hepatitis Day, sees the launch of a global movement to support the WHO goal, called NOhep, which is led by the World Hepatitis Alliance (WHA) to raise awareness and bring people together to work towards achieving this by the target year. It also provides a platform for the hepatitis community to share resources and materials. Supporters can join up here. NOhep came about because there is now real hope for eliminating viral hepatitis, with the development of a cure for hepatitis C, vaccines for hepatitis A, B and E, and effective treatments for hepatitis A and B. (Read more in related content, below). In addition, there has been greater political commitment to removing hepatitis in recent years. However, though 194 Member States signed up to the WHO strategy, 125 countries have no strategies in place to combat viral hepatitis and much more investment is needed to help them achieve the targets. According to NOhep, each year 1.4 million people die from hepatitis globally. Less than 1% receive treatment and only 5% are aware of their condition. Its campaign aims to reach over 380 million people by 2030 to speed action towards eradication. The impact of a diagnosis with hepatitis is demonstrated in the patient story below. Here a US patient relates her experience of living with hepatitis and highlights how people often have multiple conditions and challenges at the same time. “I’m 30 years old, married and the proud mother of two awesome boys. I am temporarily disabled but plan to finish school in pastoral counselling to become a chaplain. Prior to my diagnosis, I owned and operated my own photography business while attending college part-time. “I was diagnosed with acute liver failure at the University of Virginia hospital in Charlottesville, Virginia a few weeks ago. The liver failure was brought on by an autoimmune hepatitis that went undetected until it had caused my liver to be cirrhotic. The liver wasn’t the only organ affected but it was the most damaged and vitally important. It did not help that I have ‘a history of alcohol abuse’ as the doctors put it (I drank semi-heavily for four years; self-medicating). Apparently, even the short time I drank was enough to send my liver over the edge when coupled with the autoimmune disease. My specialist calculates my MELD [Model for End-Stage Liver Disease] score next month to see if I need a transplant. I’m nervous. “GERD [Gastroesophageal Reflux Disease] was brought on by the alcoholism and is something that seems to cause more complications than the steroids even. It’s quite literally a pain in the neck. I’m on such a restricted diet – I expect to be eating cardboard by next week! “I also have scoliosis, which was detected in 1993. Surgery for placing Harrington rods took place in 1995. The surgery was supposed to prevent any further curvature but I’m not sure it did. Prior to it, I had a 62 degree curve. Afterwards, it was 30 degrees. However, since then, I’ve noticed a steady decline in posture. I could wear a brace but haven’t since the surgery, so it wouldn’t be correcting anything. Putting off the inevitable, maybe. 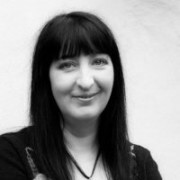 Linda Banks is Commissioning Editor at pharmaphorum. The patient experience is a genuine diary entry shared privately at www.TreatmentDiaries.com. Read more, share if you like or join in the conversation. Making sure you feel less alone navigating a diagnosis is important. Treatment Diaries connects people to those who can relate and provide support.